A mucocele of paranasal sinuses is a collection of mucus within an epithelial lined sinus whose outflow tract is permanently obstructed. The most common site for a mucocele is the frontal sinus; it is less common in the other sinuses. Frontal mucoceles present in different ways depending upon their size and duration, with symptoms often gradual and insidious. Symptoms are mainly ophthalmic and include proptosis and diplopia. The diagnosis is established by history, physical exam, and imaging studies (primarily Computerized tomography of the paranasal sinuses). Herein, we present a case of a frontal mucopyocele (type 5a) that occurred 25 years after a frontal sinus osteoplastic flap operation. Successful treatment involved endoscopic marsupialization followed by the use of a drug-eluting sinus stent to maintain ostial patency during the early post-op phase. 1.1.1 Definition and etiology: A mucocele is mucoid secretion trapped within an epithelial lined sinus that has a completely blocked outflow tract. Their tendency for expansion and destruction of the surrounding structures  occurs as the epithelial lining continues to secrete mucous into this closed space. If a mucocele becomes infected, it is called mucopyocele. The most common site of mucocele is the frontal sinus (60-89 % of cases). Sinus outflow obstruction may be secondary to recurrent sinus infections, allergic rhinitis, inflammatory conditions (Wegener, cystic fibrosis), previous trauma/sinus surgery, or benign tumors (osteoma or fibrous dysplasia) . Mucopyoceles are usually a polymicrobial combination of aerobic and anaerobic bacteriology . 1.1.2 Clinical and radiological features: Most cases occur in patients aged 40-60 years with a similar male:female incidence . Many patients initially present to the ophthalmologist with orbital symptoms, the most common being gradual proptosis and diplopia . 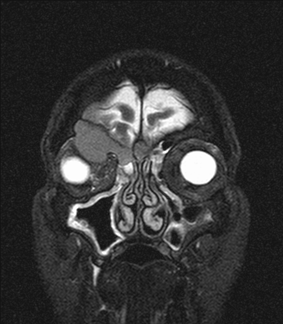 Non-contrast CT of the sinuses is the radiologic study of choice, with MRI required in select clinical situations. CT scan is important to determine the extension of a mucocele and to allow assessment of bony erosion, whereas MRI orbit is needed for differentiate mucocele from other lesions, or as in our case, the difference between the mucocele and viable fat used to obliterate the sinus. Type 1: limited to the frontal sinus (with or without orbital involvement). Type 2: frontoethmoidal mucocele (with or without extension into the orbit). Type 3: erosion of the posterior wall which may be minimal or without intracranial extension (type 3a), or with greater intracranial extension (type 3b). Type 4: erosion of the anterior wall. Type 5: erosion of the anterior and posterior walls with minimum or no intracranial extension (type 5a), or with greater intracranial extension (type 5b). 1.1.4 Management: Surgical drainage is the treatment of choice for paranasal sinuses mucocele. This can be achieved through an intra-nasal endoscopic approach, or an external approach such as a Caldwell-Luc, osteoplastic frontal flap, or external fronto-ethmoidectomy. The former is the most commonly used approach today with less morbidity and excellent outcomes. A 70 year old male presented to our clinic with the complaint of gradual and progressive right eye exophthalmos and diplopia for the prior 6 months. During this time, he has been evaluated at other facilities by Ophthalmologist and otolaryngologists, and underwent an MRI of the orbit demonstrating a right frontal sinus lesion compatible with mucocele. The lesion extended into the right ethmoid sinus and orbit with mass effect on the superior rectus and superior oblique muscles. There was also caudal displacement of the optic nerve sheath complex, and mass effect on the right globe with displacement inferolaterally (Figure 1A-1C). There were widespread chronic inflammatory changes throughout the paranasal sinuses without air-fluid levels. The left frontal sinus was also completely opacified, however, unlike the right frontal, it was not bright on T2 images, and behaved like normal fat on T1 and T2 images. Figure 1A: Pre-op MRI. T1 CORONAL w/o contrast. Figure 1B: Pre-op MRI. T1 CORONAL with contrast. Figure 1C: Pre-op MRI. T2 STIR CORONAL w/o contrast. 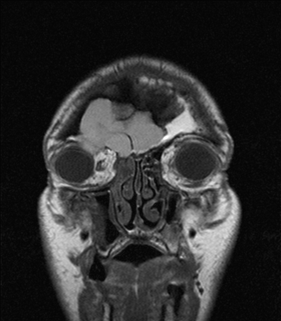 He has history of recurrent frontal sinusitis previously treated via a bilateral osteoplastic flap of the frontal sinus with fat obliteration in 1984. Exam of the right eye revealed exophthalmos and proptosis with inferior lateral displacement of the globe. There was injection of the conjunctiva on right. Vision acuity was normal. There was mild tenderness in the right periorbital area. Extraocular muscles mobility was still intact in all directions except the supero-medial direction, where it was restricted. 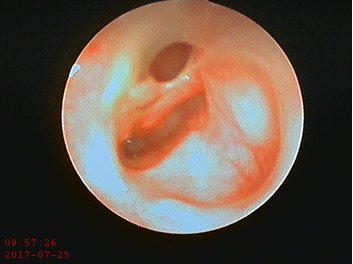 Endoscopic nasal exam revealed a septal deviation to the right, inferior turbinate hypertrophy, and purulent discharge coming from right middle meatus. The patient was not toxic at the moment, and had been treated with several rounds of oral antibiotics over the past 6 months. CT scan of paranasal sinuses was done during the clinic visit, demonstrating complete opacification of the right frontal sinus. The sinus walls were expansile without intrasinus calcification. The anterior wall was nearly absent, and there was bulging of the mucocele into the superior orbit displacing the globe as seen on MR. 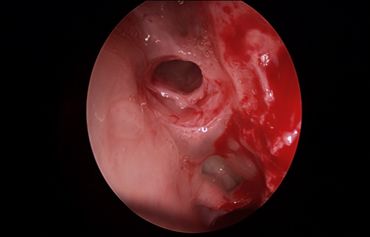 The posterior sinus wall was thinned with scattered areas of bone erosion. The left frontal sinus was also completely opacified without any expansion of sinus walls. Mucosal thickening was noted in ethmoid, maxillary and sphenoid sinuses bilaterally; and a right nasal septal deviation was also seen (Figure 2). Intranasal endoscopic sinus surgery, septoplasty, and marsupialization of the right frontal mucocele were planned with the aid of navigation system. Our surgical procedure included septoplasty, bilateral uncinectomy, bilateral total ethmoidectomy, and inferior turbinate reduction. The infero-medial wall of the mucocele that expanded into the right ethmoid sinus and obstructed the frontal recess was identified and opened using a microdebrider. Thick yellowish secretions were suctioned out of the mucocele, which was then irrigated with saline via a curved suction. The mucocele cavity was then inspected under direct visualization. Supero-medial orbital wall was mobile with external eye palpation. No pulsating secretions were noted. A kenalog/Bacitracin soaked PosiSep dressing was inserted into each middle meatus without obstructing the newly opened mucocele (Figure 3). The frontal recess on left side was noted to be obliterated from previous surgery, and was left untouched. Inferior turbinates reduction was done and surgery was completed at this point. On POD#5 the patient called the clinic with worsening headache, right periorbital pain, right eye swelling, and epiphora. He was put on oral antibiotics and steroids and asked to return to clinic for evaluation. Endoscopic nasal exam revealed edema, purulent secretions, and newly formed polypoid changes at the site where the mucocele was marsupialized. This post-op infection caused obstruction of the newly opened mucocele and recurrent symptoms. As the patient completed his medical therapy, his symptoms resolved. On POD#16, the infection was resolved; however there was residual edema of the right frontal/mucocele outflow. A resorbable dressing (PosiSep-O) was inserted into the opening of the right frontal outflow and soaked with kenalog 40 (Figure 4). The patient returned for evaluation in 1 week and on endoscopic examination the ostium of right frontal sinus was widely patent with resolution of the polypoid changes, mucosal edema, and purulent drainage (Figure 5). A CT scan of sinuses was done and demonstrated a patent right frontal recess and aerated right frontal sinus (Figure 6). The patient was placed on Budesonide + saline irrigations once daily with follow-up in 3 months. Figure 4: Post-op drug-eluting stent placement photo. 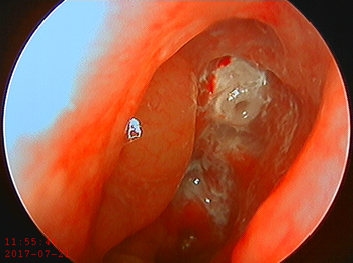 Figure 5: Post-stent placement endoscopic photo. Paranasal sinus mucoceles represent a collection of mucus in an epithelial lined sinus with an obstructed outflow tract. The bony sinus walls can become thinned and even resorb as the mucocele expands from continuous internal mucous secretions . When the mucocele forms, it continues to expand slowly causing bone erosion and remodeling, and that can cause extension of mucocele into nearby sinuses, the orbit, nasal cavity, nasopharynx, and cranial cavity. In addition to pressure changes on surrounding structures, inflammatory mediators like prostaglandins, interleukins and tumor necrosis factor are also present within the mucocele and contribute to its capability to expand. The rate of expansion of paranasal sinuses mucoceles may be accelerated by secondary infection , and acute onset of pain, headache, swelling, or facial pressure can then accompany the otherwise chronic symptoms. The diagnosis of mucocele is established by medical history, physical exam, and radiologic finding. The clinical presentation of mucoceles varies with their anatomical origin. Approximately 60?89% occur in the frontal sinus, 8?30% in the ethmoid sinuses, and less than 5% in the maxillary sinus. Sphenoid sinus mucoceles are rare . The floor of frontal sinus is shared with the superior orbit, and explains the early displacement of the orbit in enlarging frontal mucoceles . The onset of symptoms is usually gradual and insidious, and often involved the orbit in the case of a frontal mucocele. Other symptoms include headache, eye swelling, facial pressure, and nasal obstruction. Intracranial extension through erosion of the posterior wall of the frontal sinus can lead to neurological problems such as meningitis or CSF fistula . The posterior frontal sinus wall is vulnerable because it has a thinner wall. Bony erosion and intracranial extension is seen more commonly with a mucopyocele . The imaging studies are of great value in assessment of mucocele, and in ruling out other types of lesions in paranasal sinuses, orbit, and cranial cavity. On CT scan the mucocele is seen as cyst-like homogenous isodense lesion originating in a paranasal sinus and expanding into surrounding structures. Sclerotic bony changes can often be seen surrounding the lesion. Complete bony erosion can also occur resulting in mucocele extension into adjacent tissues. MRI allows one to differentiate between different types of soft tissue within the sinonasal cavities. Thus, if a mucocele develops secondary to a neoplasm or extends intracranially, an MRI is required . Signal intensity depends on the ratio of water, mucus and protein within the mucocele. In the majority of cases a mucocele will be hypointense in T1, and hyperintense in T2, and is non-enhancing after contrast infusion. 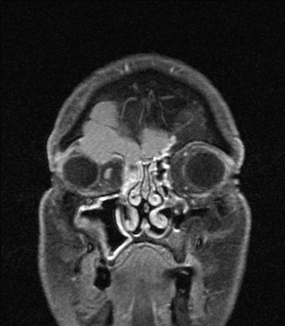 In our case, the MR images confirmed the viability of fat in the left frontal sinus. The treatment for mucoceles is surgical drainage, and the surgical approach depends mainly on the size, location, and extent of the mucocele. An external approach was previously considered the ideal treatment modality for mucoceles, but endoscopic nasal procedures have proven to be very safe, effective and successful in the drainage of the mucocele with low rates of morbidity, recurrence, and complications in most cases [9-12]. In complex cases and the presence of contraindications to the endoscopic approach, an external or combined (external and endoscopic) approach can be used [13, 14]. Examples include obstruction of sinus outflow with osteoma, mucocele in the most lateral/postero-superior region of the frontal sinus, and extensive intracranial extension. Lund VJ, Harvey W, Meghji S, et al. Prostaglandin synthesis in the pathogenesis of fronto-ethmoidal mucoceles. Acta Otolaryngol 106 (1988): 145-151. Kountakis E, Brent A, Wolfagang. The frontal sinus Stilianos Draft. (2nd Edn.). Chobillion MA, Jankowski R. Relationship between mucoceles, nasal polyposis and nasalisation. Rhinology 43 (2004): 219-224. Brook I, Frazier EH. The microbiology of mucopyocele. Laryngoscope 111 (2001): 1771-1773. Zainine R, Loukil I, Dhaouadi A, et al. Ophthalmic complications of nasosinus mucoceles. J Fr Ophtalmol 37 (2014): 93-98. Aggarwal SK, Bhavana K, Keshri A, et al. Frontal sinus mucocele with orbital complications: Management by varied surgical approaches Asian J Neurosurg 7 (2012): 135-140. Lai PC, Liao SL, Jou JR, et al. Transarucsular approach for the management of frontoethmoid mucoceles.Br J Ophthalmol 87 (2003): 699-703. Voegels RL, Balbani AP, Santos Junior RC, et al. Frontoethmoidal mucocele with intracranial extension: A case report. Ear Nose Throat J 77 (1998): 117-120. Ding CW, Wang QS, Guo QY, et al. 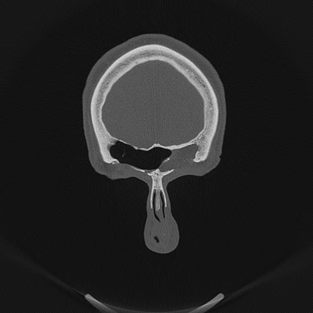 CT and MRI features in adult patients with orbital subperiosteal abscess secondary to paranasal sinus mucocele. Ear Nose Throat J 96 (2017): E1-E6. Martel-Martín M, Gras-Cabrerizo JR, Bothe-González C, et al. Clinical analysis and surgical results of 58 paranasal sinus mucocelesActa Otorrinolaringol Esp 66 (2015): 92-97. Har-El G. Transnasal endoscopic management of frontal mucoceles Otolaryngol Clin N Am 34 (2001): 243-251. Conboy PJ, Jones NS. The place of endoscopic sinus surgery in the treatment of paranasal sinus mucoceles.Clin Otolarynol 28 (2003): 207-210. Bockmühl U, Kratzsch B, Benda K, et al. Surgery for paranasal sinus mucocoeles: Efficacy of endonasal micro-endoscopic management and long-term results of 185 patients. Rhinology 44 (2006): 62-67. Lund VJ. Endoscopic management of paranasal sinus mucoceles. J Laryngol Otol 112 (1998): 36-40.